Shooters, brawlers, co-ops and survival horrors: our choice of Playstation games has never been bigger, so where’s the best place to start? Gone are the days when your biggest decision was between home console clones of Pac-Man, Space Invaders and Frogger: today the landscape of console gaming is incredibly vast, incredibly varied, and sometimes downright confusing. So, if you’ve found yourself in possession of a PS4, or are wondering what the best release might be to get for a gaming friend or relative, we’re here to help. What exactly constitutes the best PS4 games is, of course, largely down to personal preference and interpretation, but our picks are uniformly highly regarded, rated and reviewed by critics and fans alike, and each have their own unique charms. What about the best PS4 accessories? Fans of fighting games will love the new and varied combat mechanics in games like Injustice 2 and Assassin’s Creed: Origins; those looking to get scared pantsless can get their kicks in survival horror reboot Resident Evil 7, while aspiring zombie hunters can experience a slightly more emotional take on the genre with The Last of Us’ epic remaster for PS4; and those in search of jaw-droppingly good-looking maps with epic stories to match will appreciate the efforts of the epic Horizon: Zero Dawn and The Witcher 3: Wild Hunt. All in all, whatever you look for in a PlayStation game, you’re sure to find it here, so keep reading for our list of the best RPG, FPS and more for PS4. Part cautionary tale, part sci-fi, part action adventure and all wonderful, Horizon: Zero Dawn is our best PS4 game to come out of 2017. First of all, it’s downright gorgeous to look at, with every detail beautifully rendered whether you find yourself among snow-capped trees or the dunes of a windswept desert. Then, there’s the story: operating on both personal and world levels, it sees orphan Aloy seek to find the truth about her parents, and how civilisation came to be in ruin. There are a couple of niggling frustrations with combat, Aloy’s health bar as a pretty unreliable metric to name just one, but it’s a small price to pay for a game this glorious. This package also encompasses the Frozen Wilds expansion, to give you even more hours of gameplay and new terrifying enemies to vanquish. If the Nazi-whacking aspects of Inglourious Basterds appealed to your vengeful sensibilities, then you might just enjoy Wolfenstein 2: The New Colossus. It’s pretty harrowing stuff, forcing you to watch and occasionally interact with horrifying scenes, and make decisions where neither outcome is good, seeing the course of the storyline change based on the choices you’ve made. But despite the chilling alternative history setting where Klansmen and SS goons freely walk the streets, and a hefty dose of real-world morality, these are juxtaposed with some pretty hilarious moments. Set traps and watch gleefully as unknowing Nazis walk into them; double up on delightfully anachronistic weapons (plasma cannon, anyone?) to unleash maximum devastation; and mix things up with a combination of stealth assassinations and all-guns-blazing carnage. You might’ve dabbled in the odd Assassin’s Creed game in the past, but trust us when we say it’s never been like this. 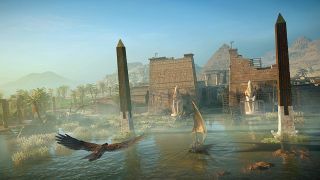 The map is vast and frankly gorgeous, rendering Ancient Egypt in glorious detail; the storyline is emotive and immersive; and honestly it’s a welcome change from a back catalogue that was getting to be slightly formulaic, with new combat techniques to play with and even a couple of surprises for Final Fantasy fans. There is noticeably less sneaking and...well, assassinating to be done than in previous titles, which might leave some players cold, but it more than makes up for it in other arenas. If you want to get immersed in a game world, and we mean properly immersed, it’s hard to beat The Witcher 3. The open world is absolutely enormous and feels epic in scale, with not just dynamic weather and a full day and night time cycle, but huge, beautifully drawn open expanses to explore. The main story of the large-scale RPG is similarly extensive, offering around 100 hours of gameplay without even having to stray from the beaten path, and at times smacking a little of padding – but stray you will, because the numerous side quests offer more than enough to keep the player’s attention, and at times are more enjoyable than the relatively straightforward main quest. There’s something incredibly wholesome about the concept behind Persona 5. You play a high school student with the ability to enter individuals’ psyches, find the dark desires that lurk there, and change their minds to make them better people – all the while remembering to keep up your social life, study for exams, and even do menial tasks like laundry and making coffee. It might sound odd, but the mix of high-flying fantasy and humdrum tasks is really endearing, and all set in a world that’s beautifully animated, bursting with personality and embellished with delightful details. And, with reviewers admitting to having logged hundreds of hours on the game, it’s certified engrossing too. With its anxiety-inducingly high stakes and phenomenally good fight mechanics, Injustice 2 is definitely one for aspiring vigilantes. Huge numbers of combos, insane Super Moves, and the ability to take makeshift weapons directly from your various weird and wonderful environments (including one particularly memorable episode with a stuffed alligator) make for thrilling and gleeful combat, and increased speeds make it a zippy improvement on the action of predecessor Gods Among Us. It’s not all thwacks and bangs though: the conflict feels genuinely threatening, not least the rift in the DC Universe that sees heroes pitted against each other, and the huge roster of playable characters puts things on a genuinely epic scale. That the best game for PS3 has made it onto our PS4 list is already a credit, but this remaster of everyone’s Game of the Year for the seventh-generation console is nothing short of heart-stopping. While replicating the same desperate situation, the same lovable (and not-so-lovable) characters, and the same overall heart-wrenching appeal, it packs extra bonus content that really makes the most of the PS4 system’s power. The game looks great, of course, but then it always did, and the graphics have been given little lifts here and there rather than completely reworked. The real winning addition is the Left Behind DLC, a playable prequel which reveals insights into Ellie’s life before teaming up with protagonist Joel. If you’ve played pretty much any Resident Evil game before, you know the drill: spooky mansion, item scavenging, lots and lots of nightmare fuel. But without getting too geeky, it’s the new RE engine that really shines in this edition, making for photorealistic settings and beautifully rendered details like skin and hair, and giving the proceedings an unsettling sense of realism that’s hard to shake. Luckily though, the appeal doesn’t stop with the artistry, and reviewers said unravelling the bizarre mystery of the creepy and incredibly atmospheric southern plantation house gave them the most fun they’d had with a Resident Evil game for years. The original Destiny’s campaign might have failed to stand up to its fine gameplay and graphics for some reviewers, but that’s exactly why everyone should give Destiny 2 a bash: it steps up to the plate and fulfils the promise of a proper story-driven campaign to add to all its other virtues. The storyline and its antagonist are suitably ire-inducing, the cutscenes and voice acting emotive, and the activities mind-bogglingly many and varied, and while it all might seem a bit daunting at first, you’ll certainly never be bored. Add to that mechanically interesting combat and weapon upgrades leaving you to feel increasingly capable as the game’s difficulty ramps up, plus a really great social aspect, and you have a thoroughly well-rounded release. Like the look of The Last of Us and Resident Evil? If it's zombie games you're after, take a look at our list of the best, including releases for PlayStation, Xbox and mobile.